International man of mystery. Well not really, although I can mangle several languages and even read the occasional hieroglyphic. A computer scientist, an author and one of the very few people who has both an NIH grant and had a book contract. 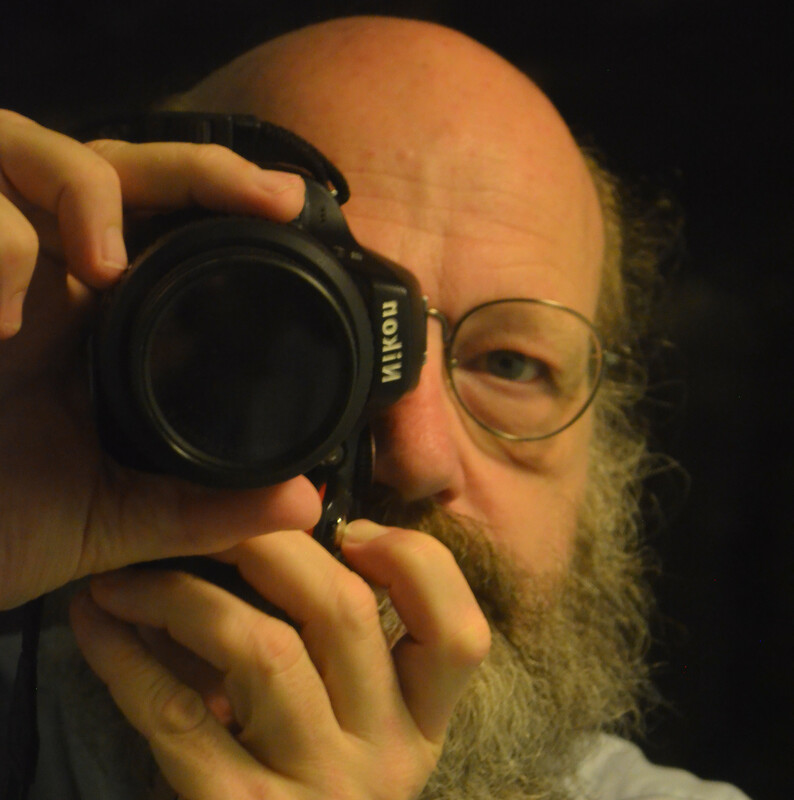 An ex- booktrope author and a photographer. 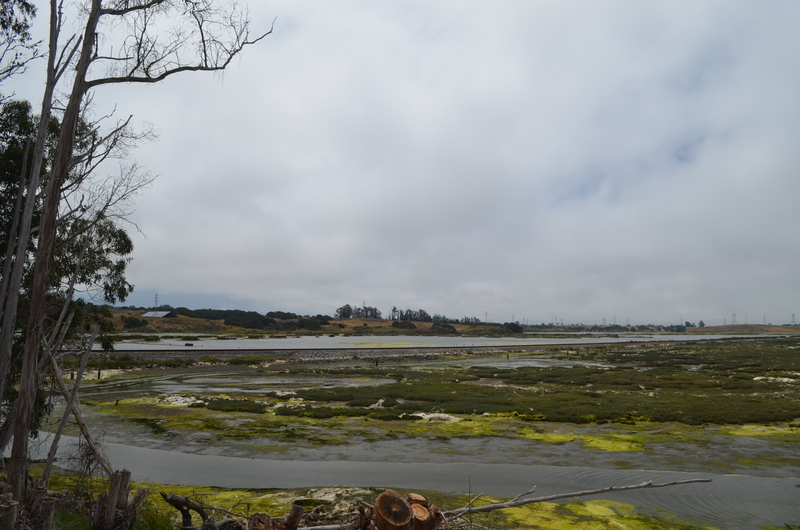 Another digression, between Monterey (we actually stayed in Marina, but more on that in another post) and Santa Cruz, we visited the Elkhorn Slough State Wildlife Refuge. It’s a great place for birds, in November through early spring, but less so in summer. Still we counted about 15 species, including a couple of new ones for the life list, so I’m not complaining. Rather I’m thinking of an excuse to visit at a better time. The Center building itself. It wasn’t this nice when I visited about 8 years ago. The refuge, an old farm, is maintained by the state and in great shape. They will lend you excellent binocculars (Eagle optics), and the rangers are friendly, helpful, and knowledgeable. 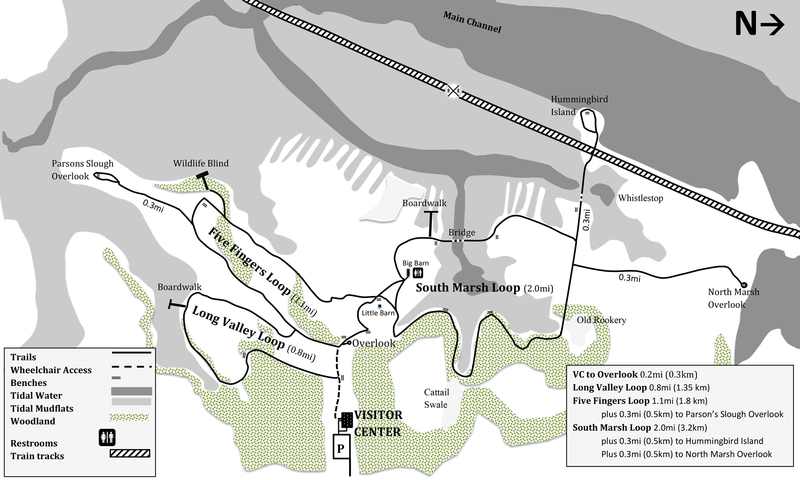 There are about 5 miles of looped trails over a range of habitat. 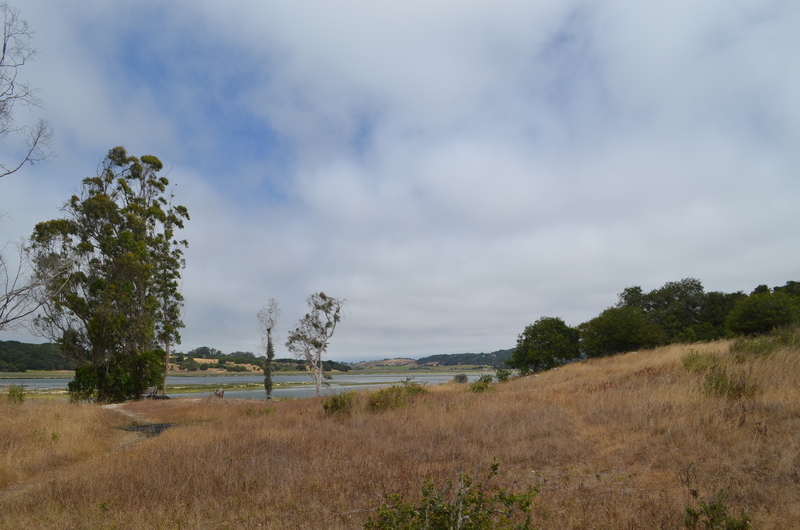 However, it’s mostly slough, mudflat, and open fields with some oak woods mixed in. A copy of the trail map that they hand out at the center. However at this time of the year, the non-avian wildlife is worth a serious look. 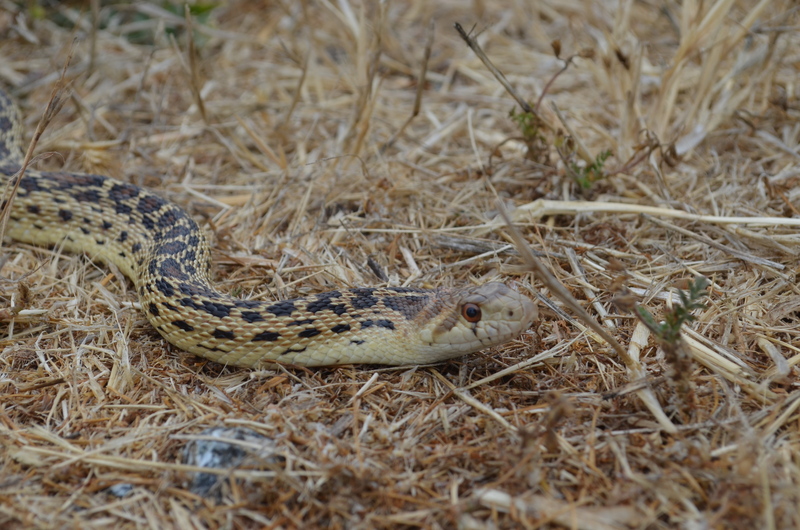 In addition to lizards (mostly fence lizards) and a gopher snake that stayed put for an intimate photograph, there were rabbits, seals, and sea otters. Sea otters! I repeat sea otters. At least two of them (both surfaced at the same time) and possibly three of them. There is a power line that crosses over the Parson’s Slough overlook. An Egret rookery is at the far side of the slough where it crosses. The sea otters were playing in the incoming tide more or less directly under the wire. There was also a curious seal, who would poke his nose up, now and then. I have to admit I didn’t believe that sea otters came in the sloughs, but I was wrong and the ranger was right. 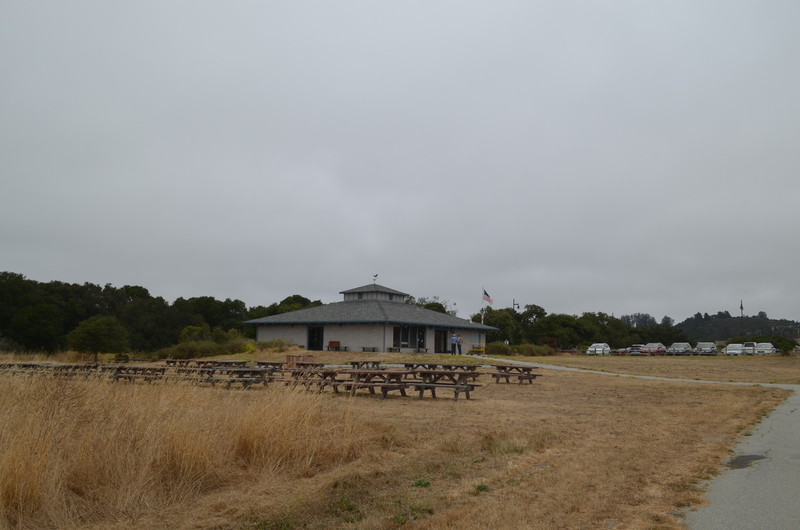 Our day started out sunny, but then the fog and chill (54F, 12C) rolled in, hence the fairly grey photos. For what it’s worth, I’m selling photos at Shutterstock and Alamy. What the heck is going on with this blog? Hiding my ugly mug behind the camera. 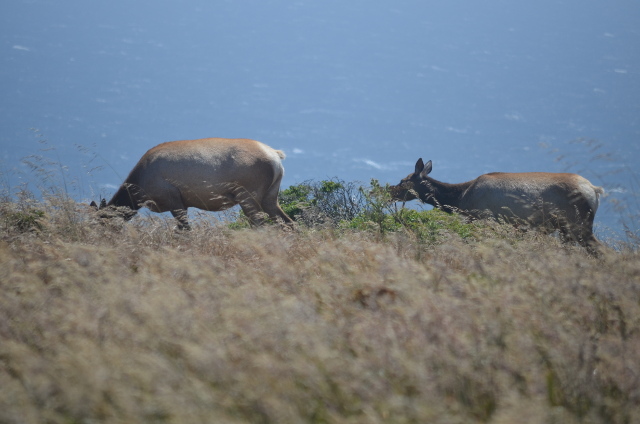 Tule Elk on Point Reyes. 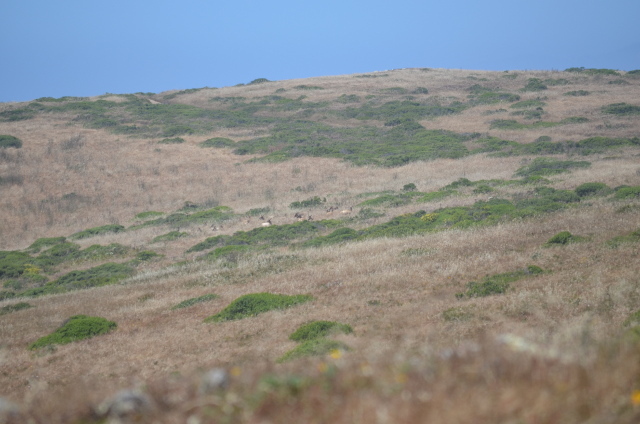 Something of a digression, but we just walked the Tomales point trail at Point Reyes National Seashore through the Tule Elk preserve. This species of elk was nearly hunted to extinction and reintroduced to park about 40 years ago. Fine, neat, but so what. The first step is to find the elk. Being prey animals, even though they’re the size of small cows, they tend to hide away. We saw three heads on the top of a ridge in the distance. Were they elk? Well, out with the binoculars. Yup, elk. Further on, to get out of the wind (Tulome trail is very windy. The Park Service quietly understates ‘even experienced hikers may find it difficult’.) we took a diversion to hide behind a pile of rocks. There was a small cluster of similar little dots in the distance. Again, out with the binoculars and quelle surprise, a herd of elk, not 100 meters from the path. Elk as little dots in the distance. So then it was just a matter of walking to the closest point on the path and waiting. While a fair number of people walked past, chatting about this and that, we watched the elk. 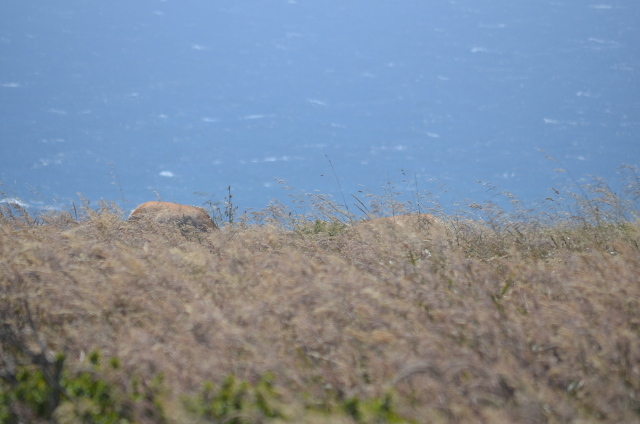 Elk backs with the Pacific Ocean behind them. At first, they were blobs in the distance. They walked closer and soon our patience was rewarded. People kept walking past without noticing the animals. Shame. These pictures were made with a 200mm lens, which isn’t a particularly powerful telephoto lens. The Start of a Most Excellent Adventure. We decided to try exploring the West coast for a number of reasons. The most pressing being to see how the trees I planted while working for the city of Salinas were doing. Well, not really, but it’s been a while and, quite frankly, we wanted to see somewhere we haven’t been recently. We started off by flying into San Jose, which is a smaller airport than SFO, but has the advantage of being much easier to get away from. 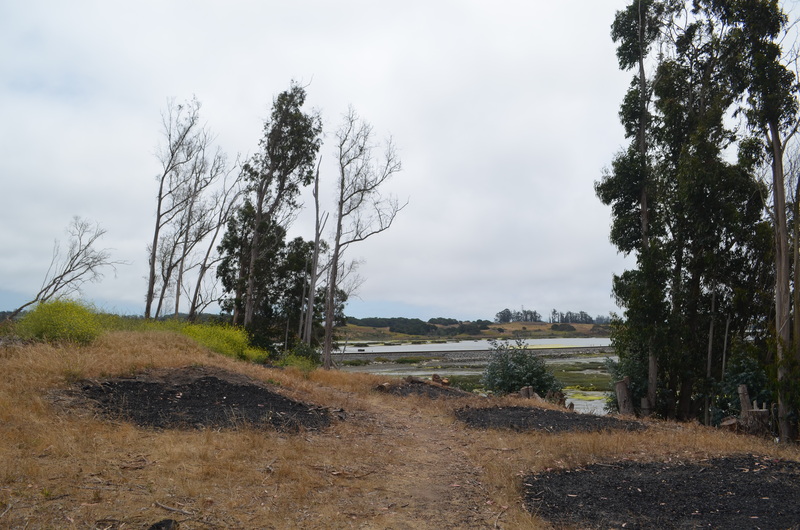 We booked a couple of nights in Antioch – near the end of the BART yellow line with plans of exploring the city. (FYI we stayed at America’s Best Value Inns there which is cheap, clean, and decent. Hazel’s drive in, just down the road, is a fantastic little restaurant if you’re in the area (bring cash – they don’t take credit cards).) If you do this, it turns out there’s no parking to speak of at the Antioch station. Drive to Pittsburg Bay Center and park there. (You also avoid a transfer). 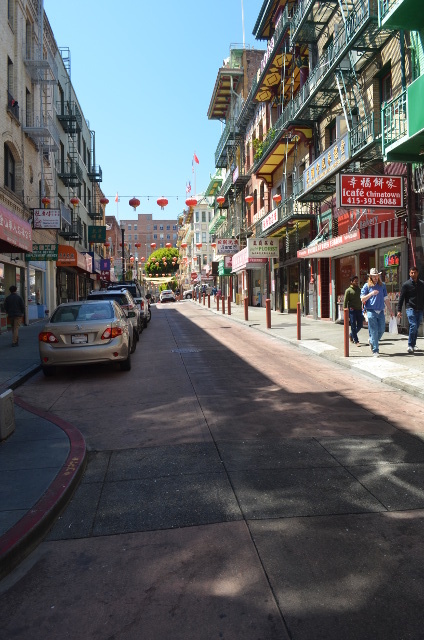 We explored Chinatown and had excellent dim sum at the Imperial Inn before walking to Telegraph Hill (the Coit Tower then pier 51). The trick to finding good dim sum is to look at the clientele. If they’re mostly Chinese, you’ve found the right place. We picked up salted plums and various Chinese candies that aren’t easy to find in Atlanta. If you walk a few streets West of the tourist area, you can find the Chinese grocery shops. There English is a scarce commodity, but the vegetables and fruits are authentic. There’s also a tension between the mainland and Taiwanese Chinese. Several of the buildings pointedly had either the PRC or Taiwan flag displayed. Unfortunately the heat followed us, it being 85-90F (30-32) instead of the more normal 60F (16). So we decided the best thing to do the next day (with inland forecasts of 35-38 (100-108) was to take the ferry. 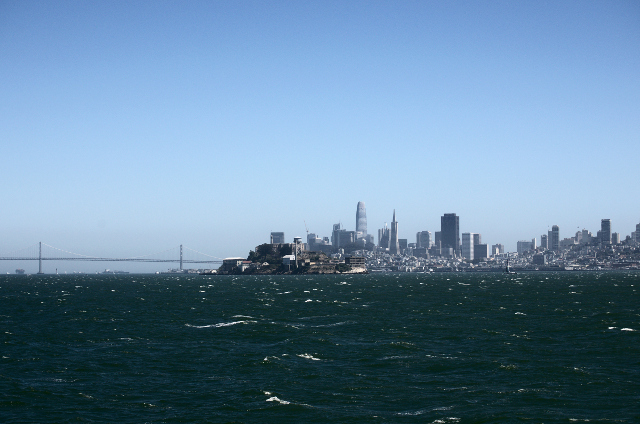 We started at the SFO ferry terminal (near the Embarcadero BART stop) and took the ferry to Sausalito. The natives posed for a practice shot with my mirror lens. It’s OK, but the resolution isn’t up to my normal standards. 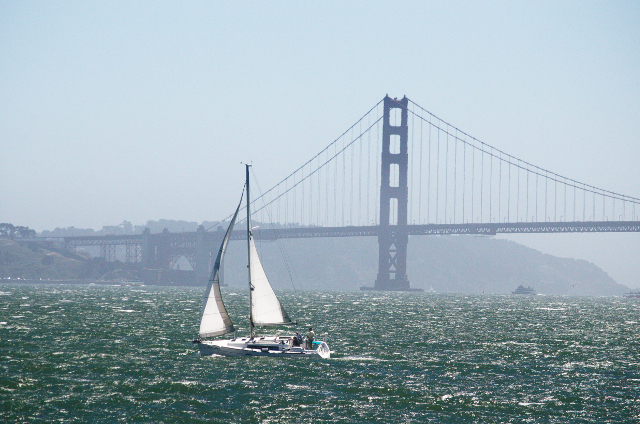 The ferry ride costs about $6.50 each way (use a clipper card, and keep track of your balance). It’s the cheapest way. There’s a bike over the bridge and return on the ferry route that looks fun, but you have to be prepared for it. (We weren’t.) 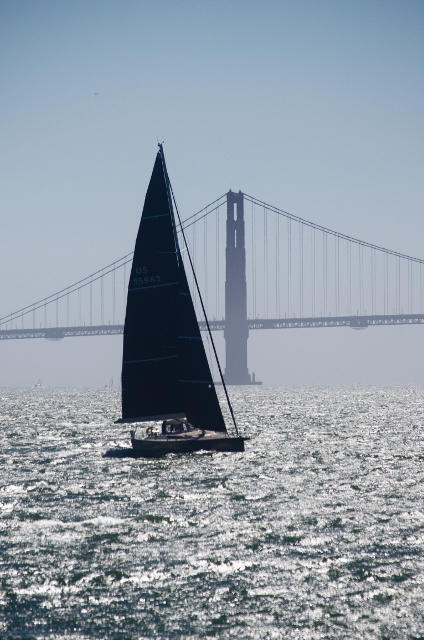 Sausalito is a bit of a tourist trap, so we walked around and admired the yachts. Most of the yachts weren’t being used, and some could be had quite cheaply – if you don’t count the work you’ll need to put in to make her seaworthy. The yachts are entrancing, but I’d need a lot of practice to move up from a sailing canoe to one of these. This is the start of another story Amelia and I are putting together. There’s a pun in the title that will become obvious in time. The story starts with Rachel, Lady Hayforth, throwing the dice in a desperate try at the marriage mart and coming up short when her carriage breaks down in the middle of nowhere. After a complicated string of happenings, she ends up engaged to Rupert, Lord Hartshorne, an aspiring chemist who did mysterious things for the war office in the recent past. His notebooks have gone missing, and a mysterious Mr Oliver is involved. Last week Rachel and her friends went to look at the stars after an eventful afternoon. George has left for the village. One might think that Rachel’s life would get simpler without this distraction, but that would be no fun. Rupert showed he has something that connects his shoulders to his hips. Last week, the start of a new chapter shows that another of his talents is important. We discovered why it was so important that Rupert come with Sir Roger recently. Rachel awoke below decks in a ship (a channel barge). Despite the sterling reputation of the English as cooks, the crew ask Rachel to cook for them. Her choice of seasonings has their desired effect. The morning after she gave thanks for her deliverance she writes to let her friends know where she is. Things, however, are afoot and the game is on – especially with the reappearance of Mr Oliver. When you’ve finished with this tripe (however well-cooked), take a look at the better authors in Snippet Sunday. A hundred yards further, That’s all, only a hundred yards, the dock. There a fisherman talked to the three men. Those three men. Them. All of them, and they did not look happy. She waited while the fisherman and the men seemed to have an argument. The wind carried the sound away. Then the men stalked off. Good, I can breathe again, Rachel straightened up. Squish, squelch, and squish again, she walked to the dock. 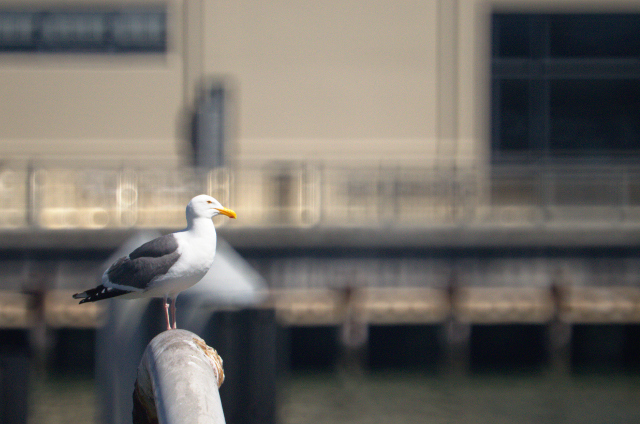 The gulls finally paid attention to her and circled. This strange creature didn’t seem good to eat, but maybe it carried food. The men ran towards her, fortunately, the fisherman did too. He reached her first. Rachel’s French wasn’t up to understanding the words, “Chienne!, Vache!, Petite Chatte!, Merde” or “Poutain!” Somehow, I doubt they’re complimentary. The fisherman’s English was within her vocabulary. He shook his fist at them, waved his boat hook and they appeared to decide that digression was the best part of valour. My intermittancy, a consequence of family matters, appears to be settling down. With that comes a sincere apology for spotty answers and returns. One of our books, set at GSU, made it to the university reddit. No sales, but still a nice thing to have happen. Amelia reminded me to put a link to our book page. The first book in our series, The Art of Deception is now available for sale with an extract on instafreebie as a teaser. Author rharrisonauthorPosted on December 3, 2017 December 3, 2017 Categories A Formulaic Romance, Chemistry, historical background, WritingTags England, Historical Novel, regency, Writing3 Comments on Sunday Snippet, Something Fishy. When you’ve finished with this tripe, take a look at the better authors in Snippet Sunday. She turned and ran. They ran faster. With no other choice, she cut across to the riverbank and slid behind a willow. The branches tore at her and the mud squeezed between her toes on her right foot. The shoe was somewhere. She waited, breathless, squeezing herself into the smallest ball she could. Rachel heard the men chuckle at the joke. Then they walked on, slowly, down the lane. Rachel cautiously unrolled herself. She saw the missing shoe, and picked it up. I can’t follow on the lane. They’ll see me. She worked her way along the bank back toward Hook, staying low and watching for the men. The mud sucked at her shoes. Eventually she took them both off and held them. The cold slime engulfed her feet and squished up to her ankles. If Rupert could see me now. Doubt that precious Charity could do this. Rachel followed the bank, bending low and dodging from bush to bush, hoping to be unseen. Her dress dragged in the ooze. While the UK in general, and England in specific, has many miles of lovely sandy beaches, it also has many miles of shingle (stony beaches) and even more miles of muck. Black stinking oozy muck. Great stuff for the kids. Great stuff, that is if you have a modern washing machine. One of the many big differences between the Regency and now is the ease of cleaning clothes. Bung them in the machine with a dash of persil, press the button, wait, and they’re clean. Through the end of the Victorian period laundry was difficult, dirty, and not at all fun. Rachel is not doing Elizabeth any favors by getting her gowns so mucky. Someone will have to pay for their cleaning. It was not uncommon for guests to receive a laundry bill when they left. Something like, “Sorry Lord Percy, the bread, the wine, and even the thou are free, but your clothes are going to cost you.” A laundry bill plays an important role in “Northanger Abbey.” when the heroine, Catherine, thinks she’s found a compromising paper in a nighttime excursion. Only it’s a laundry bill – for Eleanor Tilney’s erstwhile fiance perhaps, but still only a laundry bill. Author rharrisonauthorPosted on November 12, 2017 Categories A Formulaic Romance, Chemistry, historical background, WritingTags England, Historical Novel, regency, Writing5 Comments on Sunday Snippet, Mud. Sunday Snippet, A Sea-side stroll. Rachel put on her, actually Elizabeth’s pelisse and bonnet that she’d borrowed, and then stepped out the front door. 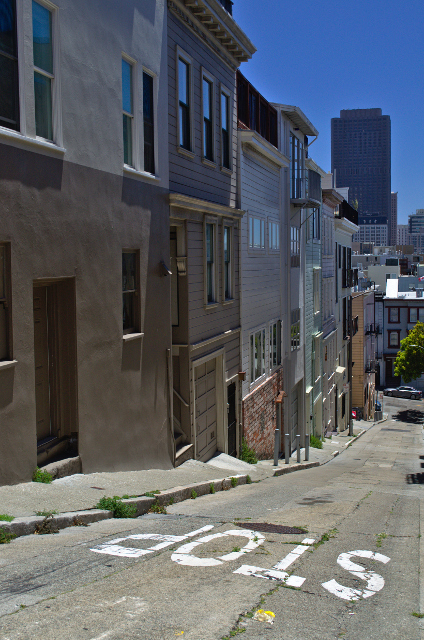 As she walked out into Church Lane, the sun warmed her face. The smell of nettles and blackberry bushes mingled with the traces of horse from the lane. A chilly breeze brought the sea smell in from the river. She took a deep breath and relaxed. Turning right, towards the river, she listened to the sound of Elizabeth’s sobbing wails. Poor girl. To be so overcome by feeling. Good thing Rupert and I are rational beings. The wailing faded as she walked to the river, replaced by the sound of gulls. They circled about a fishing dock at the end of the lane. Part way to the dock, she turned up a farm lane. I like this solitude. What am I to do about Rupert and Charity? What about George? She stood and watched the wind play in the corn. Last year was so wet, the crops rotted and the poor starved. She continued along in the warm sun, with the cool breeze ruffling her bonnet. Charity’s so clearly in the same. No. I’m his fiancée. The lane approached the bend in the River Ouse, and away from the sea breeze, the insects rose to meet her. The rank smell of the marsh replaced the fresh smell of the ocean. Time to walk back to Hook. Rachel swatted at a biting fly. She looked up. There were three men, struggling in their muddy clothes. They were walking towards her. Rachel is referring to the unfortunate combination of the “Corn Laws” – a tariff imposed in 1815 that raised the price of wheat – and the eruption of Mount Tamboura which lead to crop failures around the world. The target price (80 shillings per quarter) was so high that it was never reached. Malthus (yes, the Malthus Malthusian limits) thought it a fair price. The market disagreed. Further punitive laws were passed in the 1820’s and repeal took until 1841 when Robert Peel became PM. He’s the Peel who inspired “Peeler’s” as a term for policemen. Author rharrisonauthorPosted on November 5, 2017 November 5, 2017 Categories A Formulaic Romance, Chemistry, historical background, WritingTags England, Historical Novel, regency, Writing7 Comments on Sunday Snippet, A Sea-side stroll.